A light-filled family home for you and your dearest ones – could there be a better proposition than this? The owners’ of the trendy single storey family house that we are going to show you today have not only dreamt of such a home, but also built one exactly in line with their dream. They were assisted by the reputed architects at Klopf Architecture. The owners decided to build a modern dwelling for themselves furnished with mid-century modern furniture and other decorative features. 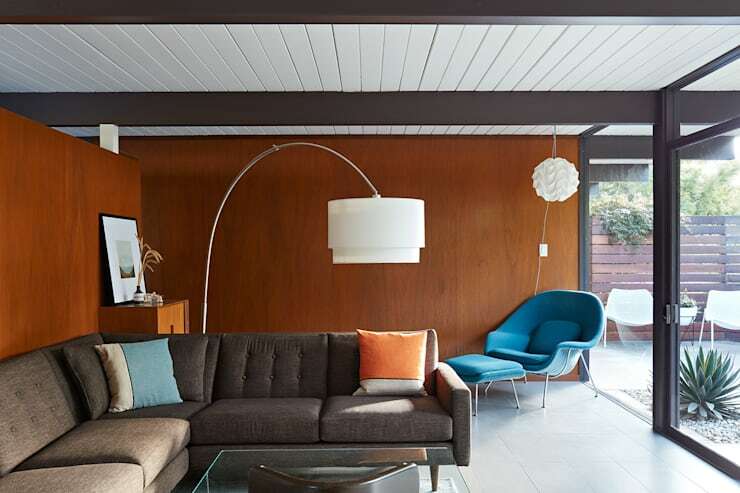 Let us step inside the Eichler House and find out what else it has in store for us. 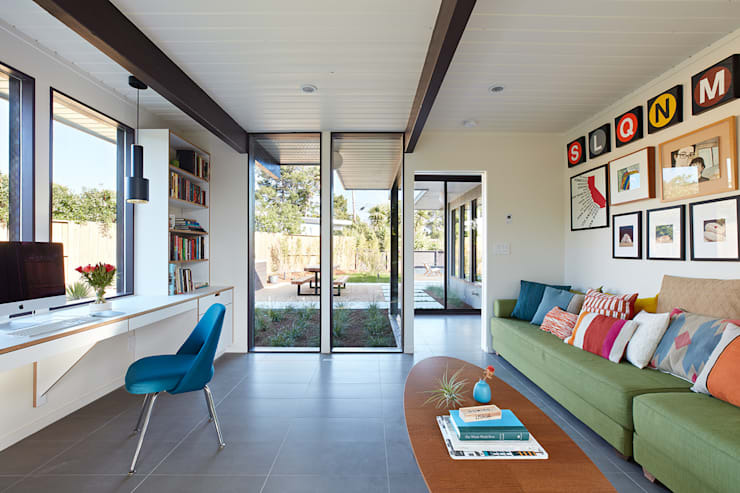 Eichler House stands in the middle of a well decorated garden. The flat roofed structure is designed with a dark greyish blue façade and plenty of glass windows. The garden path is built with concrete tiles. 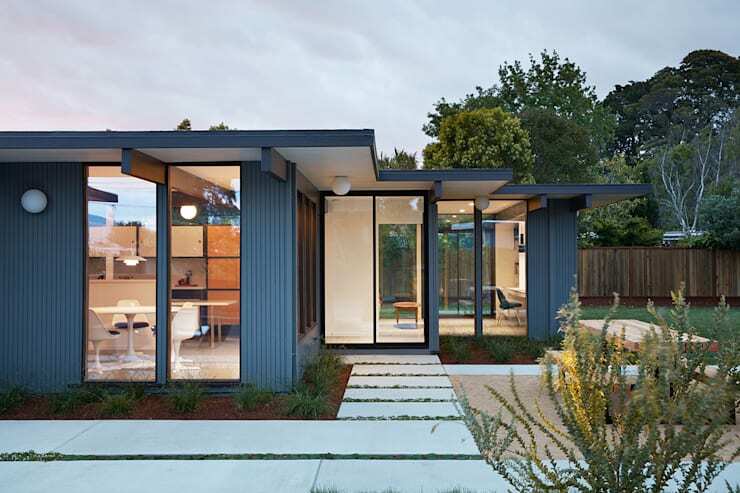 Eichler House looks neat and tidy from the exterior. Glimpses of its warm and inviting interior can also be seen from this point of view. To appreciate the interior, it is better to step inside the house. 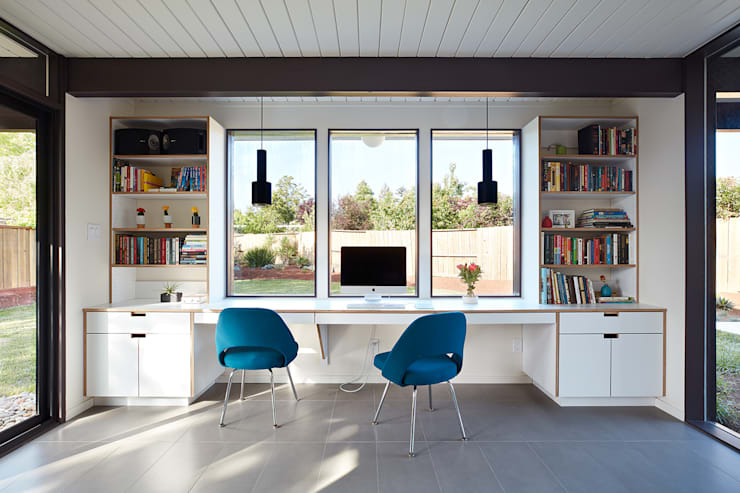 We come into this beautiful home office which surrounded by large sliding glass doors and windows from three sides. The space looks utterly cheerful. What’s more! The minimalist design gives the space an even breezier feel. The flooring of the room is designed with concrete tiles. 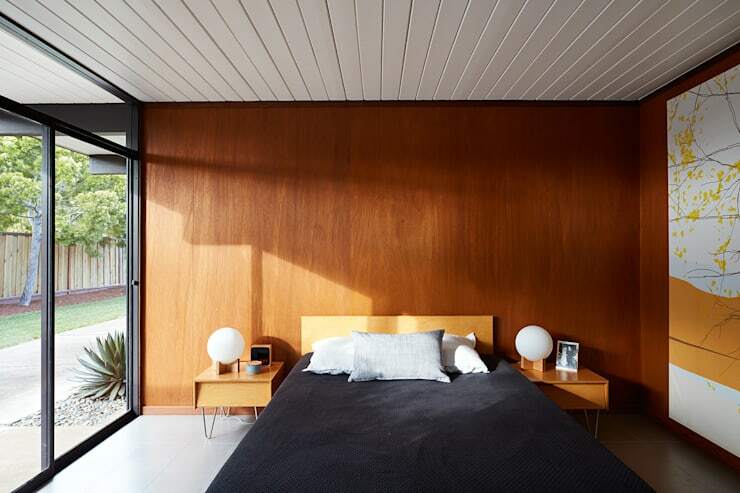 Wood clad ceiling makes the room look elegant and comfortable. Simple open bookshelves and study table make home organisation easy. The room is furnished with mid-century modern chairs and pendant lighting fixtures. The glass windows and doors allow panoramic views of the surrounding garden. Struggling to keep your home office organised? Master these super simple steps to work in a decluttered home office. Opposite to the study table, you see a set of comfortable sofas placed side by side. An oval coffee table is placed in front of the sofas. The features wall is decorated with a number of framed photographs and artwork. The seating arrangement is made further comfortable with the help of cosy cushions. Every square inch of the room speaks volumes about the tastes of the owners of the house and skills of the interior designer roped in for the job. The formal living room is decorated with a sectional sofa with dark brown upholstery. You can see a comfortable armchair and ottoman in the corner of the room. Chic pendant lighting and floor lamp maintain the brightness of the room after sunset. A glass top coffee table is placed close to the sofa. The grey tone of the concrete flooring is offset by warm wood effect wall panels. Like other part of the house the bedroom receives a generous amount of sunshine which maintains the cheerful nature of the ambience. The room is decorated with wooden wall panels. It is furnished with a simple platform bed and matching nightstands. A combination of beautiful table top lighting fixtures and elegant wall art increases the charm of the interiors. 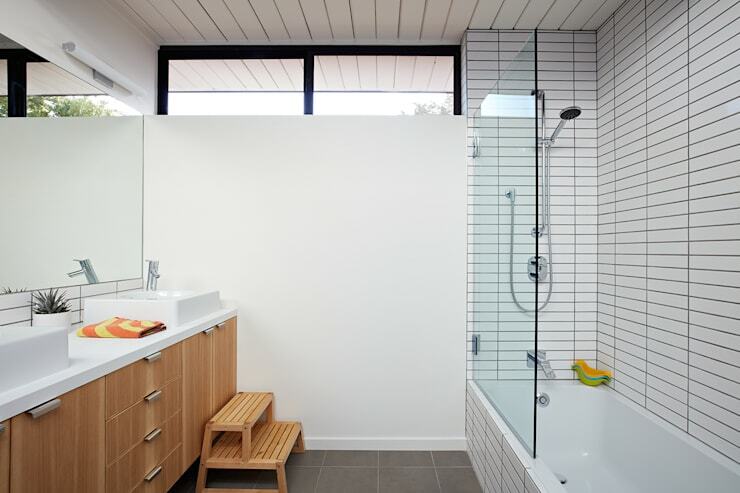 The interior of the bathroom is designed with a combination of wood, concrete and ceramic tiles. A stylish modern vanity unit take away the storage concerns of the inhabitants of the house. The large frameless mirror is in tune with contemporary décor and helps making the space look more expansive. Glass windows ensure the space receives ample sunlight in the daytime. The house is designed with a small but tastefully designed patio. An outdoor entertainment area has been set up close to the dining area and kitchen. It is furnished with a cosy outdoor sofa, simple wooden dining table and a couple of benches. Landscaped lawn and small plants beautify the surrounding garden. Craving for some more? Check these cute small home designs right here. 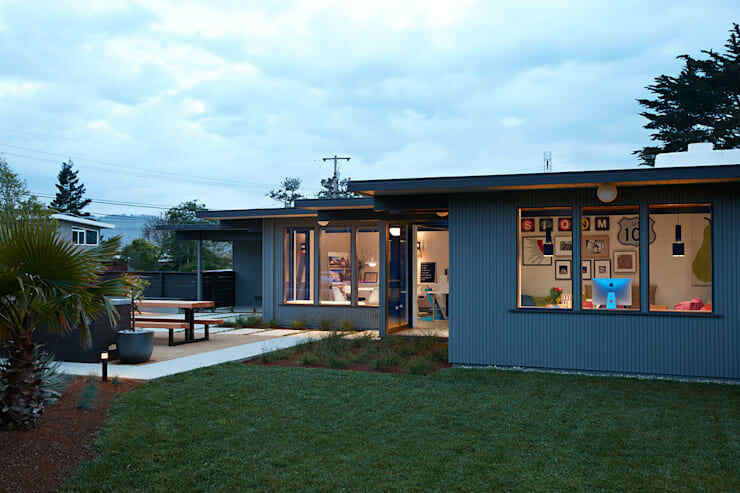 Which feature of this small family home did you find most attractive?